The 2013 Cahow nesting season is off to a good start, Bermuda’s Conservation officer Jeremy Madeiros reported yesterday [Mar.6] when he released this photo of a chick that is less than one week old. For the first time since its rediscovery in 1951, the population of Bermuda’s critically endangered National Bird passed the landmark number of 101 nesting pairs in 2012. During a major famine in 1621 Governor Moore sent 150 of the most weak and sick settlers “to Cooper’s Isle, where were such infinite numbers of the birds called ‘Cahowes’, which were so fearless, they might take as many as they would…they so much consumed and wasted by carelessness and surfeiting, many of them [settlers] died ” from over indulgence. The Cahow soon disappeared from the historic records and it was thought to have become extinct. 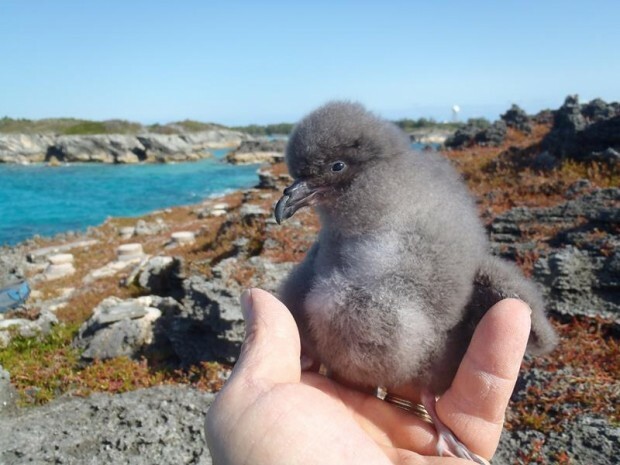 In 1951 the endemic Bermuda petrel was miraculously rediscovered on several small rocky islets but the entire population consisted of only 18 nesting pairs, with the entire population only producing seven to eight chicks annually. For the last 50 years the Cahow Recovery Programme has been one of Bermuda’s priority protected species projects. Now managed by the Terrestrial Conservation Section of the Department of Conservation Services the team works hard to control predators, build artificial nest burrows, and carry out research to better understand the Cahow and enable it to recover. That is just about the cutest bird I’ve ever seen. I know, right?! So cute, so soft and fuzzy. Great to hear that they are doing well! What a nice news story! Saw a Cahow this morning flying in Baileys Bay…..Looking great….. If Jeremy Madeiros is reading this… could you tell us if there are on other part of the island aside from Non-Such? Good day Mike; no, the Cahow only nests on Nonsuch and 4 tiny half-acre islets and rocks in the Castle Harbour Islands. One of the limiting factors is that they can not survive in the presence of rats and other mammal predators, and i keep rats off the Castle Islands by a vigorous baiting program. Virtually every other island or rock in bermuda is accessible to rats, which are good swimmers and go from island to island this way. They also only come in from the open Ocean to the nesting islands in Castle Harbour at night,so the birds that many people are seeing soaring in the high winds around the coast during the day are all verious species of Gulls, that have been blown here from the East coast of North America (even sometimes from Europe). The only place to see Cahows from land is from the outer tip of the Coopers Island Nature Reserve about an hour or so before sunset, when they gather outside the reef line waiting for night to fall to go in to their nesting islands. The best times to do this is all through November, and from mid January through late March. The windier it is, the more likely you are to see them, as they love wind, but they will often not come in at all if conditions are very calm. Is Coopers Island NR open to the public at dusk (I understand the site is under restoration) and is it accessible by public transport? My wife and I are visiting the country next week from the UK. I am a birder (but my wife isn’t!) and would be great to get an opportunity to see something of this enigmatic bird. What time is dusk next week? You can catch the bus and walk to Coopers Island. Good work on the part of the conservation team. I’m elated to see the revival and ever improving habitat of these birds.